The Army stamps were for use only through military channels. 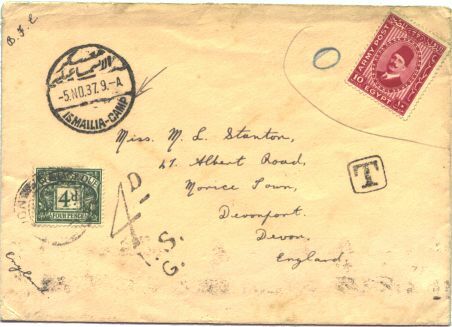 The cover here has been posted into a normal civilian postbox, hence the postmark of Ismailia Camp. It therefore then received the 'O' marking showing that the stamp was invalid for use. 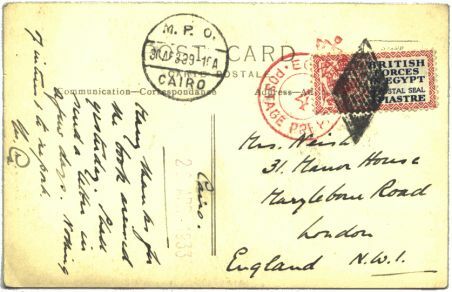 Subsequently it then received the boxed [T] in Egypt and a postage due stamp in England for 4d, double the postage rate of 10 milliemes (equal to 2d). The small 3 milliemes stamp was brought out for the concessionary rate for Christmas in October 1940. 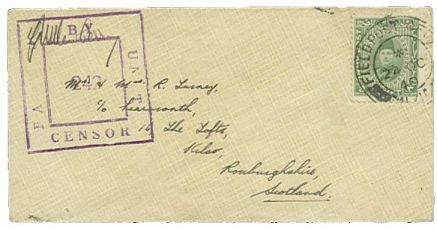 However free postage was implemented soon after, making its use redundant: only a few covers were posted early, making its genuine on cover quite rare.